Like I said, it was purely for looks. Customers complained about the gap on the EFK barrel. The 1/4 of an inch will have no change in function. So it's ok that the thread adapter contacts the slide cover about a half turn before it's snug? Wouldn't this damage the cover when it smacks into the adapter during cycling, or possibly the threads on one or the other? I also tried the thread adapter on a friends older, longer barrel, and it never got near the shoulder before it got tight, we're not sure where it actually tightened up. You can see EFK also changed the way the shoulder is cut between the two, there was a big gap between the end of the threads and the shoulder before, now it's gone. I don't like the looks of it contacting the slide cover. Maybe need to modify the adapter? It should stop against the rear shoulder on the barrel. Touching the cover slightly is not a big deal. Just like the gaps between the slide cover and frames folks have posted about form years there is a large amount of free play in the cover and variance in the covers themselves. It's just the cover though not the metal part of the slide. Again this is what people wanted so that is why it was changed, people wanted it snug up against the slide cover. Something is wrong here. 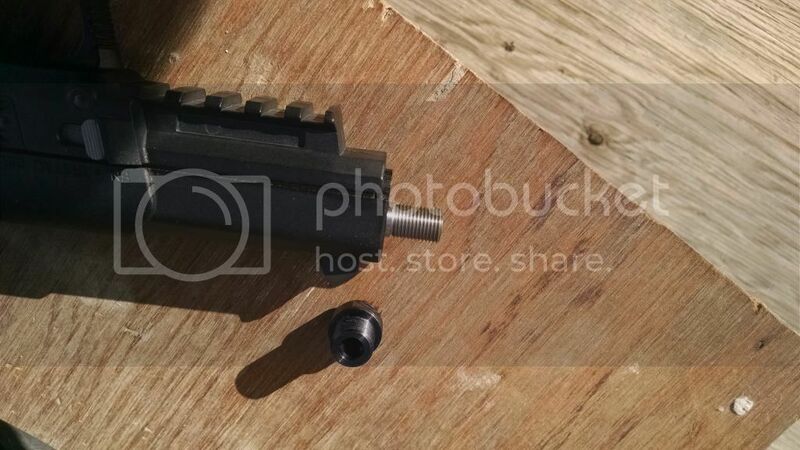 Is this barrel and adapter from us? All are test fit before the leave the shop. 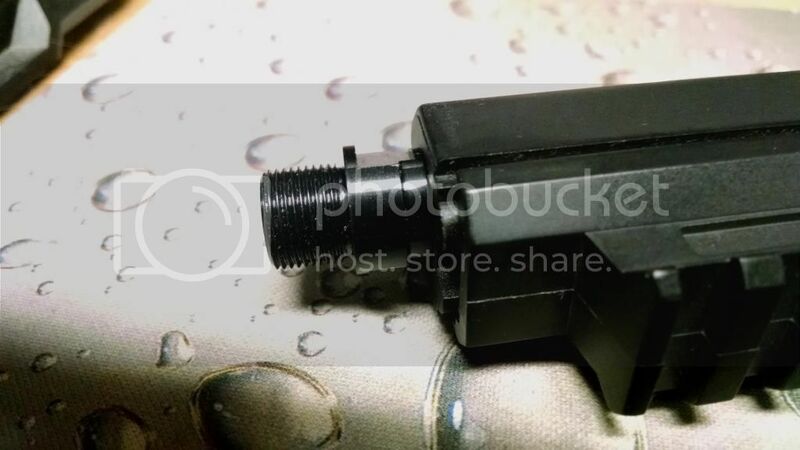 The adapter is threaded all the way through internally and not a blind hole. If it did not hit the shoulder it would turn all the way though and out the front. So it buts up against the shoulder on the barrel. Are you sure you tightened it all the way? The thread pitch has a very tight tolerance. OK I am looking into shaving some of that rear section off from the adapter since there is so much concern. Thanks for the information. I was going to order a Jarvis barrel before I read this. The only problem is that the Jarvis barrels are in stock and these are not. Do you have any on hand? Also I would like to use a sparrow so I would need an adapter right? Actually they are very different. Just look at the pics at the beginning of the post. It clearly shows that. If you think they are identical it may be time to have your eye glass prescription reviewed. Jarvis chambers are also crap. Fit and finish is also lacking. Maybe the Jarvis wives may want to talk to their husbands about increasing the quality of their product. I talked about this in a coffee chat. When I came across Jarvis barrels with massively out of spec chambers causing neck separations. I contacted them just to let them know I had come across a problem. They literally told me to <profanity> off. panzermk2 wrote: Actually they are very different. Just look at the pics at the beginning of the post. It clearly shows that. If you think they are identical it may be time to have your eye glass prescription reviewed. Really, why did they treat you that way. That is poor business ethics 101 there. That was unprofessional of them. I absolutely love my EFK barrels and you do great work. I just think it is a little unprofessional to speak badly about another business that is all. I am a fan of EA and I refer my friends to them who are involved in the 5.7X28mm platform. I spent 20 years in the Corp environment where not one <profanity> would tell the truth about a bad product. I when I get asked why EFK instead of Jarvis I tell the damn truth. You may not like it, but honestly I don't care. I call it how I see it when asked. You will never have any doubt about how I think or feel about something. You will always know 100% where you stand with me. If a product is <profanity> I can't call it anything other then that. This is also why I strive to make the best possible product at all times. 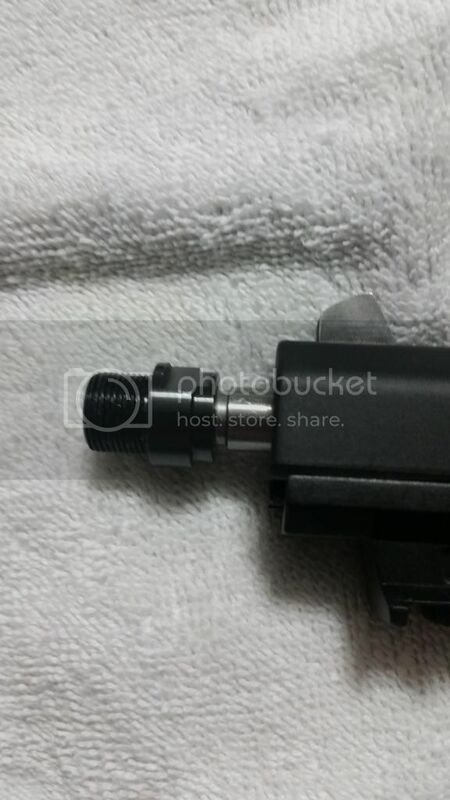 This is why I am changing my barrel adapters already. For a perceived problem, not even one that has cause damage or failed to work. Helps me sleep better at night. PS. I also can't help to calling out Tactifag douchebaggery. panzermk2 wrote: PS. I also can't help to calling out Tactifag douchebaggery. I remember you doing that with the sidesaddle on the KSG thing. Well I would much rather have Quality that quantity infact that is what I do for a living I am a quality control inspector for waste to energy company (fluidized bed combustors). I am also working on cheap plasma fuel that I will run test trials on a may patent it in tractors if it goes somewhere. So I indeed require anything I purchase to have exceptional quality. I love EA and love there products keep it up!!! I have a Jarvis barrel. I find that mine jams up a lot, especially with S4 Ultra RapTOR, but even SS198LF results in premature carbon build up and requires cleaning. I like the length and fit of the Jarvis. It seems compact and balanced but I suspect the extra space (that should not be there) in the chamber is causing the malfunctions. It is shame the store hit me so hard on the Jarvis. Certainly it's not worth the $600 plus tax headache. I also have the heavier EA spring on the Jarvis barrel. Considering that one wants less velocity on a suppressing system I question that move on my part. I was NOT impressed with the finish on the Jarvis and I think the EFK steel might be superior. Here is the new slightly shorter EFK barrel with our revised adapter for that barrel and the thread protector for the adapter we are going to now include with all barrels. The original longer barrels will still be available on a limited basis. Less of an issue since we will have our custom EFK 7 inch barrel very soon. I am still sorting and sifting through my system with the Jarvis. Bill gave me some tips which seemed to help. And I called Gemtech and Joey's tips helped as well. I am shocked by the fast build up of carbon which appears to limit range sessions and require more cleaning. Over all I am pleased with sound suppression. It is easier on me and makes me a better neighbor. While it is totally legal to shoot here, there are so many animals that I am sure my use of a can is appreciated and what they don't know is just fine. I can't tell if my jams and misfeeds are due to my errors (in cleaning and lubricating) or the main spring or the various mags and their springs are interfering. Of all the rounds I have shot suppressed S4M seems to cycle best. But I think the FN factory barrel with my broken in mainspring is more reliable. Yes, I am ambivalent: I love the dampened sound report but can not carry with a suppressor. Just got off the phone with another customer with a keyholing tornado tech extension. Why people? I don't own stock in EFK ok?!?!?! Just get a good barrel and be done with it. Thanks for your honesty Jay. I love your products for my PS90 and for reloading the 5.7x28 rounds. I will definitely order your barrel once I get a Five-Seven.